I know I know there is nothing original about milk and high speed photography, but lets be honest our ideas and inspirations usually come from an extension of someone else’s ideas. When I see others peoples work I often find myself thinking “Pssssh , I could do that”. When I saw the photos at http://aurumlight.com/ (slightly NSFW), especially the series with the sword fighters, I realized – no, no I couldn’t. I was, however, very inspired. My son spends a lot of time walking around the house yelling things like, “Dad look it’s “Pida man” or “Soup – e – man!” (He’s 2. Enough said.) He loves superheroes, and so do I.
I thought I can make a superhero. 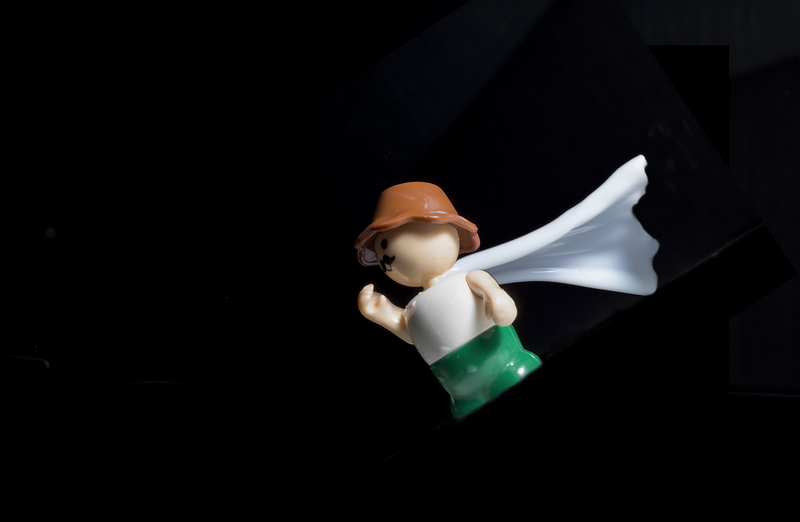 I’ll just use a lego man and try to get a highspeed photo of him “wearing a cape.” A milk cape that is! Well it turns out the only lego man I actually have in my house is a Vetruvious figure from the lego movie and he’s already a superhero that wears a long white robe, so not much to go with there. Unless I put another robe on him or something. My son does have a few little tikes figures that he calls his “friends” and since they were readily available I thought I would give them a try. After about 7000 failed attempts at getting anything awesome in camera I finally had enough source images to try and accomplish what I wanted through post. Here are the two source shots I used. These two shots gave me the two building blocks to make the cape (the milk splash was a good shape and while totally in the wrong spot still entirely usable) and have a nice clear image of the figure. First things first I correct the expose and tried to tone down the blown highlights. Then I opened both images in seperate documents in photoshop. I cut the man from one image and the large milk splash from the other. I then created 3 new layers on the original image of the man. 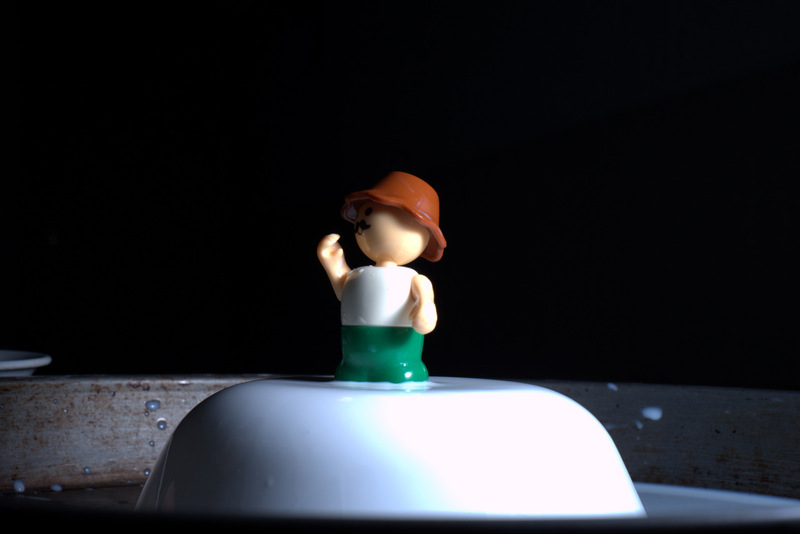 I had the background layer then the milk splash then the top layer was just the cut out of the farmer. I then set to work with the layer masks to try and create a nicely defined edge on the cape as well as blend the man and cape to make sure that the right parts of the cape were behind the man and that some of it was in front of the parts of the man that would be covered had he actually been wearing a cape. Then I used some blend as well as some simple brush strokes to try and perfect the lines. I then selected all the foreground and any background parts of the image that were just clutter. I filled black over everything and left the stacked layers to create the depth without it looking like I had just cut and paste a picture from a magazine. Using a brush with soft edges I carefully painted black over every remaining unwanted surface. I then made the edge of the brush more solid and lowered the opacity to create a bit of shadowing along the edge of the cape. Flattened the image and then rotated it and cropped it. 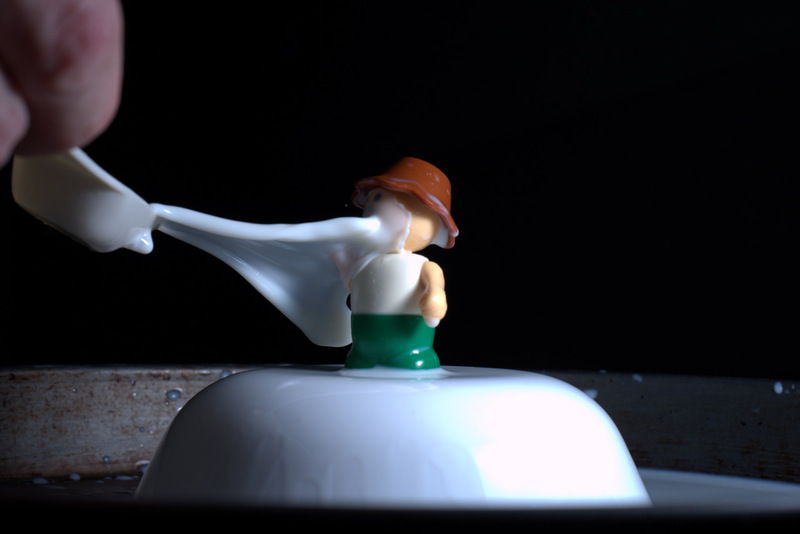 This entry was posted in 2014 Photo Project, Photos, post processing, Uncategorized and tagged 2014 photo project, cape, farmers, high speed, lego, milk, photo, photo prject, photography, photos, post processing, superheroes. Bookmark the permalink.